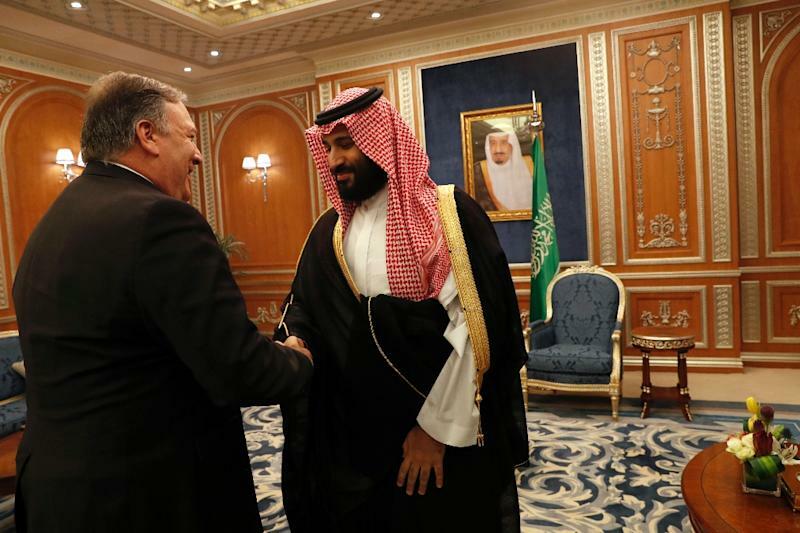 Riyadh (AFP) – US Secretary of State Mike Pompeo faced a tough balancing act Monday as he pressed Saudi Arabia’s crown prince over critic Jamal Khashoggi’s murder while shoring up strategic ties with Riyadh. The top US diplomat, on an extensive Middle East tour, held talks with King Salman and his son Crown Prince Mohammed bin Salman, which also focused on the conflict in Yemen and countering threats from Iran. Pompeo walked a diplomatic tightrope on his second politically sensitive visit to Saudi Arabia since Khashoggi’s murder as he demanded that all those involved in the crime be held accountable. The king and crown prince “both acknowledge that this accountability needs to take place”, Pompeo said in Riyadh following talks with them. “They reiterated their commitment,” he added. Relations between Riyadh and Washington have remained strained after journalist Khashoggi was murdered on October 2 inside the Saudi consulate in Istanbul. Riyadh said the murder was carried out by “rogue” Saudi agents, but the US Central Intelligence Agency reportedly concluded that Prince Mohammed very likely ordered the hit. Pompeo’s meeting with the crown prince lasted around 45 minutes. The US diplomat appeared more reserved than his previous visit at the height of the Khashoggi affair, when his broad smiles with the crown prince outraged many Americans. US President Donald Trump has brushed aside critics to stand by Prince Mohammed, who faces international opprobrium over the killing. Riyadh prosecutors have announced indictments against 11 people and are seeking the death penalty against five of them, but they have exonerated Prince Mohammed. Trump has said Washington wants to preserve the alliance with the oil-rich kingdom, which he sees as a bulwark against common foe Iran and a lucrative buyer of US arms. Furious over the murder, US lawmakers have demanded Washington pull back its support to the Saudi-led military campaign against Huthi rebels in Yemen. But backing the Saudi position, Pompeo accused the rebels of failing to comply with a truce agreement for the lifeline port city of Hodeida reached last month at UN-sponsored talks in Sweden. “The work that was done in Sweden on Yemen was good, but both sides (need) to honour those commitments,” Pompeo said. Rights groups called on Pompeo to also press Prince Mohammed over the jailing of women activists in the kingdom, amid claims that some of them faced sexual harassment and torture during interrogation. Pompeo on Monday said he discussed human rights issues with the Saudis, including the plight of women activists, without giving any details. Pompeo was in Riyadh as part of an extensive week-long trip to the Middle East, which included stops in Amman, Baghdad, Cairo, Manama, Abu Dhabi and Doha. After Riyadh, Pompeo wrapped up his Middle East tour with a trip to Muscat, where he held talks with Omani ruler Sultan Qaboos. The sultan hosted Israeli Prime Minister Benjamin Netanyahu last October in a rare visit that raised the prospect of normalisation of Israel-Gulf ties. Pompeo, however, cancelled a scheduled visit to Kuwait in order to attend a family funeral at home, US officials said. On Sunday, Pompeo met Qatar’s Emir Sheikh Tamim bin Hamad al-Thani in Doha, where he refused to comment on reports Washington had recently considered military action against Tehran. He also called on Qatar and other Gulf Arab countries to end their worst political rift in years, which has seen Doha diplomatically and economically isolated by neighbouring former allies for the past 19 months. Saudi Arabia, the United Arab Emirates, Bahrain and Egypt — all US allies — cut ties with Qatar in June 2017, accusing it of supporting terrorist groups and seeking closer ties to Saudi arch-rival Iran. Qatar — also a US ally — denies the allegations and accuses the countries of seeking regime change. “As for the GCC… we are all more powerful when we’re working together when we have common challenges in the region and around the world,” Pompeo said, referring to the six member nations of the Gulf Cooperation Council. He added that “President Trump and I both believe the ongoing dispute in the region has gone on too long”. Mediation efforts by the United States, which at first appeared to back the boycott of Qatar, have stalled, as highlighted by the recent resignation of US envoy Anthony Zinni. For Washington, turning the page on the crisis is essential for the successful launch of the Strategic Alliance of the Middle East (MESA), a NATO-style security pact that includes Gulf countries as well as Egypt and Jordan.